I have always loved traveling and having kids hasn’t changed that. It’s true that traveling with children is a completely different experience but it is still special in its own way. Although there are places Zizou has traveled to that he probably won’t remember, I strongly believe all of the adventures with him are shaping him as a person and how he sees the world. Reduce Travel Time: When going on vacation, there are certain things that are worth spending extra money on, and I think reducing traveling time is definitely one of them. 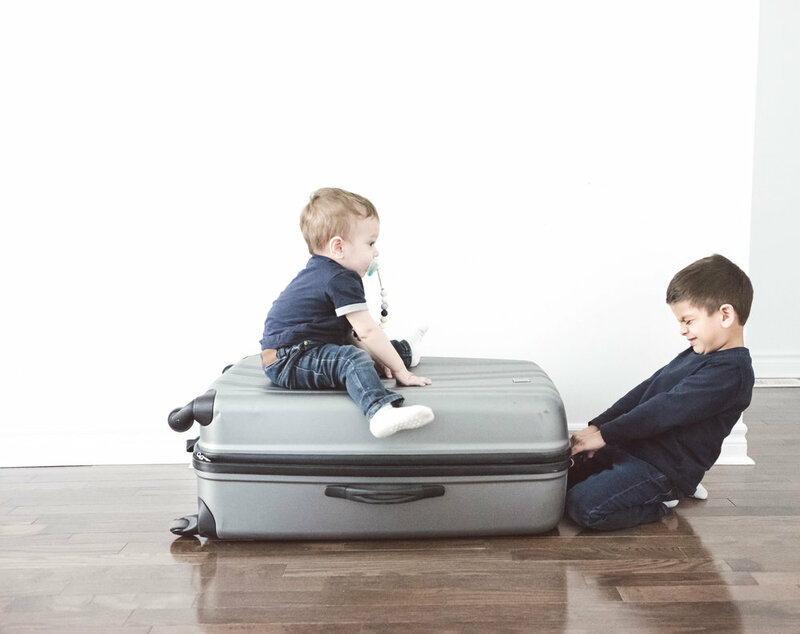 Personally, I try to book direct flights and choose flights that are overnight, if available, so the two little ones sleep through a good chunk of it. Public transport can be time consuming and tiring with kids. Try using taxis or Uber instead. Pack to keep them busy: Being on long journeys can be boring. I find it helps if you have a bunch of different activities that you can use to entertain your little ones. I usually go to the Dollar store to get several cheap options that I don’t mind losing or forgetting. On our recent trip to Pakistan, for Zizou (who is four now), I bought a bunch of different snacks, colouring books and pencils, stickers, a few small cars, books, and small figurines. For Baby A (who is one), I got snacks and small rattles and toys. He loves emptying things, so putting everything in a bag for him and having him empty it over and over again killed a good chunk of time. So just try to take different things that you can use to mix it up. Most flights have good entertainment systems now, but its always good to download a few games and movies as well. One Activity Per Day: Before I leave for my vacation I make a list of all the things I want to see on my trip and categorize them into “must-see” and “would be nice to see” groups. I make sure to have one main activity per day, and if the kids seem to be interested and comfortable with more activities, we add them on. If not, we take it easy and let them relax and play. With two kids, it just isn’t possible to have fully packed days, so we just explore at their pace. Be Flexible: I know this tip seems obvious, but when traveling with kids, you have to be flexible. Kids are unpredictable on a regular day, so when you add in traveling to the mix, it can be overwhelming. I know it can get frustrating when things aren’t going as planned, but just take one day at a time. Travel with groups: This would have to be my best piece of advice I can give you. Before I had kids, my family was scattered around the globe, so we used to pick one vacation spot per year and meet there. We kept that tradition going even after I had my kids and it has been such a blessing. When you travel with family or friends, you get more helping hands and breaks and they get precious bonding time with your children. Thanks for reading and leave any tips you may have below! (Scroll below for a couple of more pictures of my little travellers)!